Ice cream in the winter may seem a bit odd, but snow cream is a delicious treat designed just for the season. 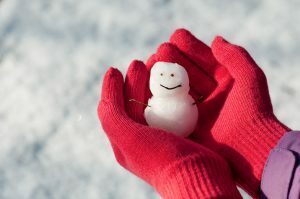 Collect about eight cups of clean, fresh snow from outside or leave a bowl outside while it’s snowing to gather snow. Mix together 1 teaspoon of vanilla with a can of sweetened condensed milk (or 1 cup of milk and ¾ cup of sugar, if you don’t have sweetened condensed milk), and pour it over your snow. Let your kids mix it until it has an ice cream-like consistency (adding more snow if needed), and enjoy! For fancier snow sundaes, add sprinkles, chocolate sauce, or other favorite ice cream toppings. 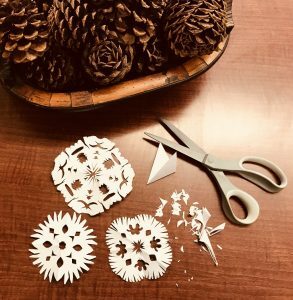 While the natural snow might have to mostly stay outside, making paper snowflakes is an easy way to bring the snow day excitement inside. While there are thousands of templates online that will help you make paper flakes shaped like Elsa or the Abominable Snowman, it can often be more fun to let kids stretch their creativity and make their own designs by simply folding and cutting any way they would like. If your kids are looking for something less common than paper snowflakes, try homemade puffy paint. Mix together 1 cup of flour, 1 teaspoon of salt, and about 1 cup of water. Make sure to get out any lumps. Your “paint” should be about the consistency of thick pancake mix, so add more water or flour if needed. Transfer to a squeeze bottle (or put it in a Ziploc bag and cut off the tip of a corner) and let your kids squeeze out designs onto a heavy piece of paper. White is great for snow art, but you can mix in a couple drops of food coloring to expand your options. Once the picture is complete, carefully transfer the paper to the microwave, and cook it for 15-30 seconds. The “paint” should puff right up! Let the pictures cool before trying to display them. Don’t worry; they’ll stay puffy. Once your house is thoroughly decorated, why not try out the reverse and take the art outdoors? Fill small spray bottles with very cold water, and add a few drops of food coloring, shaking or stirring to combine. Find a large patch of clean snow, and let your kids spray designs onto it. Don’t forget to take pictures, though. You wouldn’t want to lose their masterpieces once the snow melts! Snowball fights are wonderful, but eventually the cold and dark will drive even the bravest warriors back inside. Keep the fun going, and sneak in some engineering at the same time with mini-catapults. All you need are plastic spoons, rubber bands, and popsicle sticks. Rubber-band a stack of popsicle sticks together. This will serve as your fulcrum. Band two more sticks together, with the band close to one end. Carefully push the fulcrum in between the two sticks, raising the top one up at an angle. Rubber-band a spoon to the angled stick, with the bowl facing upwards. Next, grab some marshmallows to serve as indoor snowballs, pop one on the spoon, pull down, and let it fly! Kids can also try building their catapults out of other materials (chopsticks or rulers, for examples) and experiment with the height of their fulcrum to see how far and high they can get their marshmallows to go. Don't Forget about the Library! Even when the snow forces CRRL to close its branches, we’re still here for you. Try out our Kanopy Kids streaming service for fun movies, TV shows, and video adaptations of your favorite kids' books, such as the Ezra Jack Keats' classic, The Snowy Day. Once the kids go to bed, Kanopy’s collection of documentaries, indie films, and award-winners provides a great way to unwind. For those who have exhausted the stack of books they stocked up with before the storm hit, CRRL has plenty of eBooks, eAudio, and eMagazines for all ages ready for download. And, if you’re coming in before the snow hits, why not try some of our favorite snowy day book choices? Tired out from playing in the snow? Grab some hot chocolate, and settle down with a good book. Beautiful photos show how animals get ready for the first snow of the season. A young girl hopes an ice dragon can save her world. A mother teaches her son to write 10 Chinese characters... in the snow. It's up to Katy the Tractor to dig out the town after a big snowstorm. Laura and her family are stranded by a blizzard for months! What's going on with nature, above and below, while the snow is on the ground? A girl and her father go on a nighttime, snowy journey to find a special bird. Winner of the Caldecott Medal for its illustrations.